Temperate gardens are dynamic places that change all the time. It’s one of the reasons I love living here in the Piedmont of North Carolina. There is always something to look forward to as the garden moves through the different seasons. All too often, landscapes become static, when little to no plant diversity is included in a planting arrangement. So many people are in search of the perfect plant, specifically the evergreen plant that blooms all the time, doesn’t get taller than five feet high, never needs pruning because it has the perfect shape, is well adapted to all soil types and all environments, and has no pest problems. If that plant existed, our landscapes would be so boring. So here is my list of 10 must have plants in the garden. Lenten rose (Helleborus orientalis) is a fantastic evergreen perennial that grows to be 12 to 18 inches tall and wide. In the winter from late January through April, it flowers with colors ranging from pale greenish white to purple. This plant grows in dry shade and does not tolerate sun. It’s a perfect ground cover for massing underneath a tree. (Deer resistant). Japanese maple (Acer palmatum)is a small to medium sized tree in a large range of shapes and colors. Some species have weeping forms while others are upright and surprisingly tall. They all make gorgeous specimen plants. I’ve never met one I didn’t like. 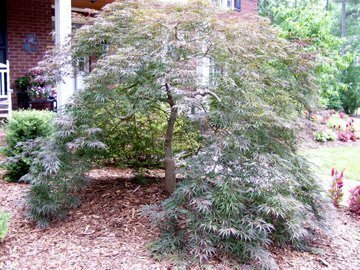 Japanese maples make outstanding understory trees, but will withstand full sun. They are drought tolerant once established with fall color that ranges from gold to red and purple. Some outstanding species include ‘Sango Kaku’, ‘Tamukeyama’, and ‘Viridis’. (Deer resistant). 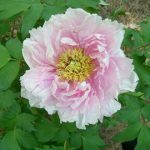 Peony (Paeonia) is a wonderful perennial with gigantic spring flowers so big they need support to prevent them from flopping over. This plant grows to be between 2 to 3 feet tall depending on the cultivar and about 3 feet wide. It takes full to part sun and is drought tolerant. Colors range from white, pink, and magenta. Some excellent cultivars include ‘Felix Crousse’, ‘Sarah Bernhardt’, and ‘Festiva Maxima’. 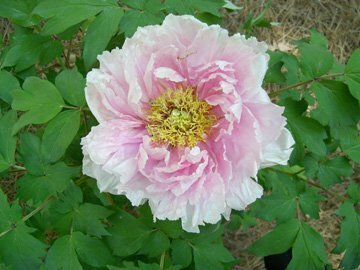 If your property is shady consider the Japanese tree peony, Paeonia suffruticosa. (Deer resistant). Paperbush (Edgeworthia) is an excellent deciduous shrub that grows 6 feet tall and wide. It has an outstanding mounding habit with fragrant flowers in the winter that hang down like bells. This plant needs well-drained soil and part to full shade. (Deer resistant). 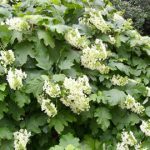 Oakleaf hydrangea (Hydrangea quercifolia) is a deciduous shrub that has enormous white flowers that can be over a foot long in the summer, and large oak-like shaped leaves that turn crimson red in the fall. 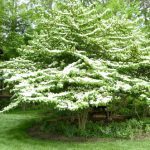 This is a large shrub (10 feet tall by 12 feet wide), but there are new smaller cultivars like ‘Pee Wee’ and ‘Snow Queen’. They prefer moist well-drained soils and morning sun with afternoon shade. (Not deer resistant). Redbud (Cercis canadensis) is a beautiful spring flowering tree growing 20 to 30 feet tall and wide. There are some weeping varieties such as ‘Lavender Twist’ and ‘Ruby Falls’, as well as cultivars with outstanding leaf color such as ‘Hearts of Gold’ (yellow heart shaped leaves) and ‘Merlot’ (purple heart shaped leaves). This tree flowers in early spring before the leaves come out, around the same time the dogwoods bloom. (Deer resistant). False holly (Osmanthus) is a large evergreen shrub that looks similar to hollies without the berries. What makes them special is their fragrant flowers that perfume the air in the fall and can be smelled a great distance away from the actual plant. Some species like Osmanthus fragrans can grow to be 20 feet tall by 15 feet wide. Others like ‘Goshiki’ can grow to be 10 feet tall by 6 feet wide with variegated foliage. This plant prefers full sun to part shade and moist well-drained soils. (Not deer resistant). Double file viburnum (Viburnum plicatum var. 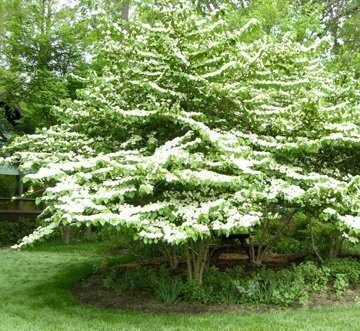 tomentosum) is a wonderful medium to large sized deciduous shrub that can be pruned into tree form. 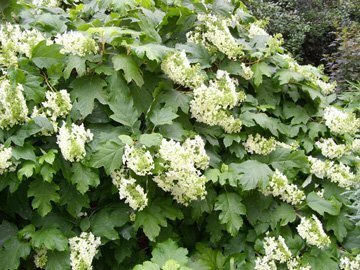 It has outstanding lacecap white flowers in the late spring with a layered habit, blooming around May. Red berries follow in late summer with purplish red fall foliage. There are new cultivars available that include ‘Shasta’, ‘Pink Beauty’ and ‘Mariesii’. (Deer resistant). Muhley grass (Muhlenbergia capillaris) is a hardy native ornamental grass that takes full to part sun and can withstand a variety of soil types. It is very drought tolerant and blooms in the fall. This plant looks outstanding when planted in mass. It grows 30 inches tall and wide and comes in pink or white. (Deer resistant). 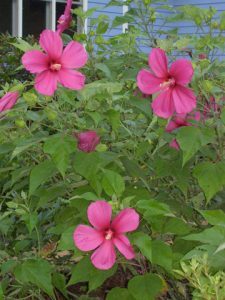 Swamp hibiscus (Hibiscus moschuetos) is a perennial hibiscus that dies down to the ground every winter, returning in spring and blooming summer through early fall. 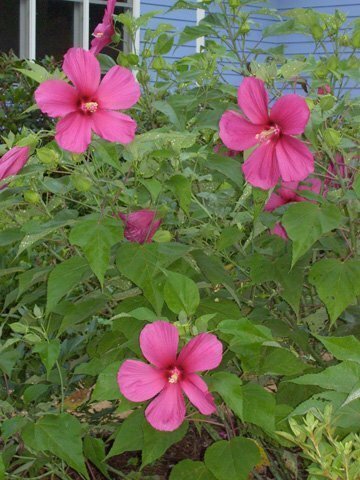 This hibiscus has the same dinner plate sized flowers as the annual hibiscus and comes in a wide range of colors. It also thrives in a variety of different soils and will withstand wet feet. Some outstanding cultivars include ‘Fireball’, ‘Disco Belle Pink’ and ‘Southern Belle’. (Deer Resistant). Photos courtesy of Michelle Wallace.